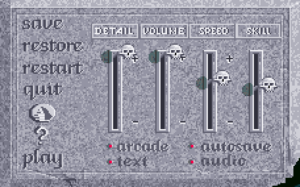 The floppy disk version requires the manual to pass the in-game DRM. The CD version requires the disc to be in the CD drive while playing. 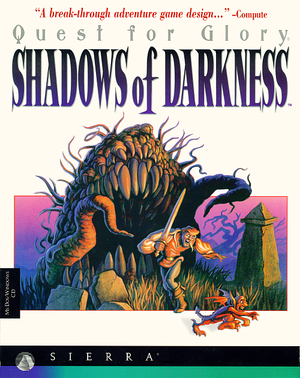 CD version pre-packaged with DOSBox. Bundled with all other Quest for Glory games. Pre-packaged with DOSBox. Bundled with all other Quest for Glory games. Patches are available for the retail releases. The GOG.com version is already patched. 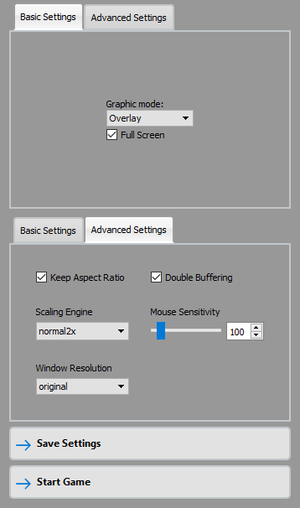 In-game options menu (CD version). Spoken speech is only available on the CD version. ↑ 1.0 1.1 File/folder structure within this directory reflects the path(s) listed for Windows and/or Steam game data (use Wine regedit to access Windows registry paths). Games with Steam Cloud support may store data in ~/.steam/steam/userdata/<user-id>/502750/ in addition to or instead of this directory. The app ID (502750) may differ in some cases. Treat backslashes as forward slashes. See the glossary page for details. This page was last edited on 27 March 2019, at 03:12.